Caitlyn Jenner, formerly named Bruce Jenner, has finally revealed herself and her debut photo shoot on the cover of Vanity Fair is causing quite the stir on social media. In addition to revealing herself on one of the biggest magazines in the world, Caitlyn Jenner joined the popular social media website, Twitter. You can follow her on Twitter by searching her username @Caitlyn_Jenner. Her new social media page has taken Twitter by storm. Caitlyn’s first tweet was simply the photo of her Vanity Fair cover with no caption. The cover, which has gone viral, shows Jenner in a white corset bodysuit with her long locks of hair. The photo is simply captioned “Call me Caitlyn,” and was photographed by celebrity photographer Annie Leibovitz. Caitlyn Jenner’s Twitter has only been live for three hours now, and she has already earned herself a following of 900,000+ (at the time of this article’s writing). Her first tweet received 150,000 retweets and 130,000 favorites, while her second tweet received 150,000 retweets and 190,000 favorites. And these numbers are increasing by the second. Every time we click refresh, the numbers have gone up. The Twitter world has been incredibly supportive of Caitlyn and her debut. Various fans have come to share their support publicly. Just yesterday, E! News confirmed that Kim Kardashian was pregnant with her second child. We guess Caitlyn Jenner was not going to let Kim take her attention, and with her social media numbers growing this quickly, it is certainly Caitlyn’s time to shine. 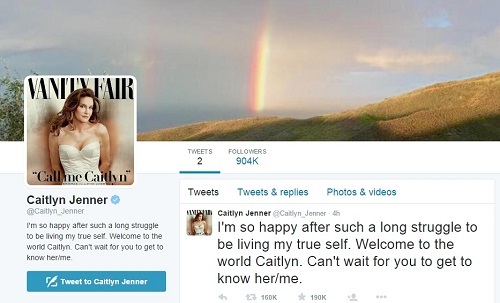 For now, we will have to wait for any further announcements from Caitlyn Jenner through her official Twitter page. We are sure that she will say something more very soon. Also, we wonder if Kris Jenner is crying her eyes out that Caitlyn spells it with a “C” and not a “K.” What do you think about the new Caitlyn Jenner Vanity Fair cover? Bruce Jenner Allegedly Steals $150,000 Worth Of Dresses From Kardashian Home: Kris Jenner Planning To Sue? Kris Jenner Abusing Drugs, Alcohol To Cope With The Bruce Jenner Transgender Coming Out News – She’s Self-Destructing?